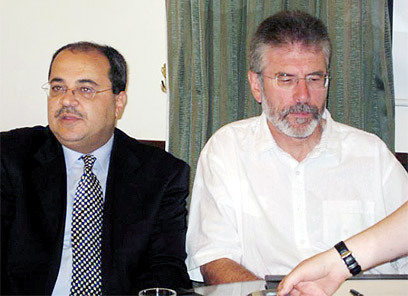 The October riots, the separation fence, and the Family Union Law – those were the topics at the center of the meeting between Deputy Speaker of the Knesset, MK Ahmad Tibi (United Arab List-Ta'al), and Gerry Adams, leader of Sinn Fein, the political arm of the Irish Republican Army. During the meeting, held Wednesday in Jerusalem, Adams said he met with Tibi into to hear firsthand of the situation of the Arab minority in Israel and on the need to fight the discrimination against them. According to Tibi, Adams asked to hear details about all realms of life and discrimination against the Arabs in Israel. "He asked to know if there are laws that the Knesset passes that perpetuate discrimination. We focused on one example in the law that doesn't allow the union of families on both sides of the Green Line. He said that sounded terrible to him and asked what the legal and political options are to change the law," said Tibi. "He told me that he had heard and read about me and was very interested in the struggle for the voters. He asked why the rightwing also tries to disqualify us in every elections campaign, and added that he is happy I ultimately manage to win," Tibi added. During the meeting, Adams asked for updated written material on the situation of Arabs in Israel. Adams was also interested in government allowances to Arab citizens. "I mentioned the October riots and the killing of 13 citizens by the police and we compared it to 'Bloody Sunday' in Northern Ireland," he said. Bloody Sunday took place on November 21, 1920, when the British massacred innocent Irish people in a soccer stadium in response to the actions of the IRA. "This is an educated man with broad perspectives who takes an interest in minorities all over the world. He feels the discrimination and oppression in his blood and he show empathy toward minorities and oppressed nations. I explained to him that the struggle of the Arab public is a political, public, and parliamentary struggle," said Tibi. The two also touched upon the Israeli-Palestinian issue. Adams said that he intends to meet with Hamas leaders even though it will mean that official Israeli representatives won't meet him. "In his opinion, serious dialogue is the way to solve conflicts," added Tibi. Adams said that one cannot hold elections as part of a democratic process without accepting their results. "Therefore, he will meet with democratically elected officials," explained Tibi. "He is updated about the number of Palestinian casualties recently in the Gaza Strip. I told him that since the Lebanon war, 257 Palestinians have been killed in the West Bank and Gaza Strip." Tibi said they also spoke about the separation fence. "I told him that this is a racist separation wall, which the International Court of Justice has asked to be removed. I also said that we support the principle of two states on the condition that this will bring about the end of occupation of 1967 territories," he added. The two ended their meeting warmly, but not before Adams invited Tibi for a similar meeting in Ireland. According to Tibi, "I would be happy and proud to meet with the leader and figure who fought for freedom and independence, who has resisted foreign rule of his country. I appreciate Gerry Adams and his activities as a symbol of the struggle for freedom and shaking off a foreign and oppressive regime." See all talkbacks "Tibi tells Sinn Fein leader of discrimination against Arabs"